Kilmory Oib, well and cross. General view from East. Kilmory Oib. General view of settlement from South. Kilmory Oib. View of West face of cross. This erect sculptured stone, measuring 4'3" x 1'3" x 4" stands at the W end of a well flowing in a stone-lined tank, in a clearing among ruined houses on N side of Forestry Commission road. The cross on the face towards the well is incised, The other is in relief. D Christison 1904; M Campbell and M Sandeman 1964. 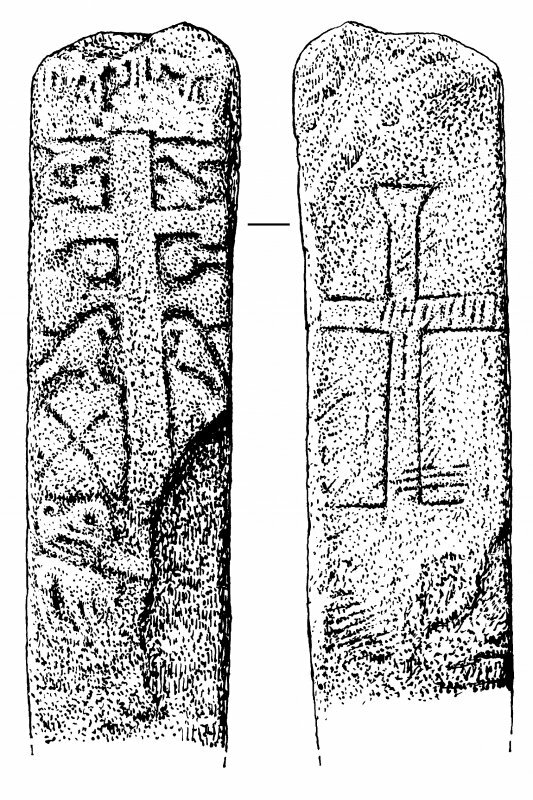 The cross-slab and well are as described. Visited by OS (DWR) 22 May 1973. Visited by OS (TRG) 25 January 1977. 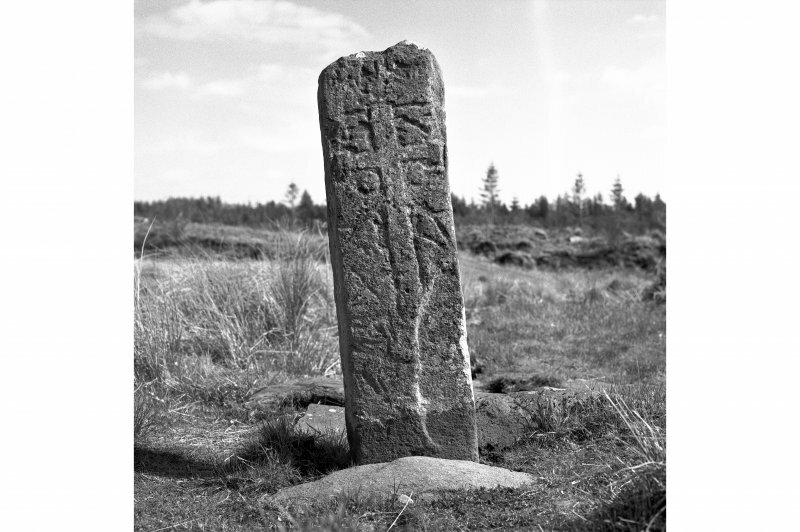 This Early Christian cross-slab stands at the wedge of a well surrounded by the ruined buildings of the former township of Kilmory, in an area which was recently cleared of dense conifer plantations. The site is about 40m w of the forest road along the NW shore of Loch Coille-Bharr, and 1.5km from the head of Loch Sween. 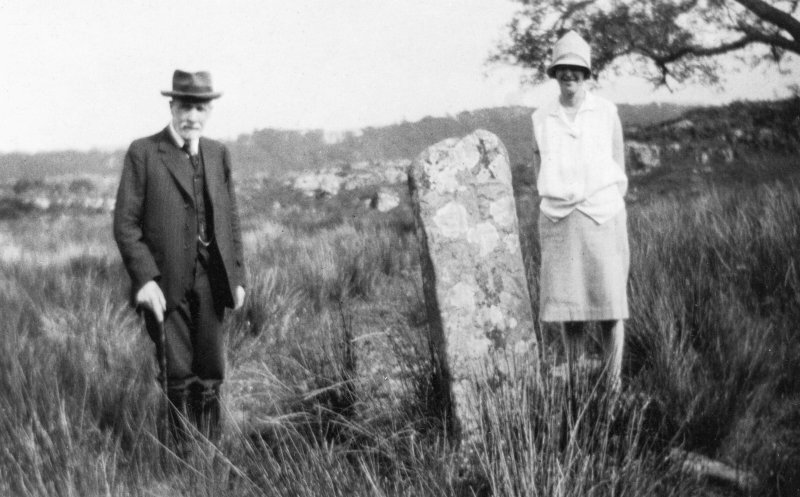 There is no evidence of the burial-ground, dedicated either to the Virgin Mary or St Maelrubha, that is implied by the place-name. The stone is a roughly rectangular slab of local chlorite-schist, 1.37m in visible height by 0.40m by 0.11m thick; the top is irregularly broken, and the lower right part of the W face has flaked off. The W face (a) is carved in low relief, using incision and pocking to outline the main features in such a way that it is not always possible to distinguish between intended motifs and areas left uncarved. At the top, which is damaged and much worn, there are two opposed animals, both apparently horses and that at the left perhaps with a rider. This is followed by a cross with a square-ended top arm and a transom with barred terminals, having above the transom two opposed birds, perched on what have been described as leaves (en.1) but appear to be uncarved areas, and below it two discs, probably representing sun and moon; the disc to the right has an attached bar extending to the edge of the slab. Below this, at just above mid-height of the cross, is a second transom, with narrow curving arms expanding to broad terminals, and then the cross-shaft is flanked by a second pair of birds, whose inclined attitude contrasts with the horizontal position of those above. Immediately below the left bird, flanking the foot of the cross-shaft, there is a panel bearing an incised saltire, probably for one of the thieves' crosses at Calvary, and there are traces of a corresponding saltire to the right, most of which has flaked off. At the foot of the slab, to the left, there are at least two animals. The E face (b) bears an incised outline cross with a triangular upper terminal and square-ended side-arms, and the foot is open, but it is marked by lines extending to each side. Since this base-line corresponds in level with the apparent base of the cross on the W face, it appears that both carvings are contemporary. The cross-head and shaft are marked by a discontinuous series of short vertical incisions, which may be early, but the significance of the bolder vertical grooves on the right cross-arm and cross-head, and similar horizontal markings near the foot of the shaft, is unknown. Pairs of birds, both doves and peacocks, are frequently associated with the cross in Gaulish and Mediterranean sculpture and metalwork, and the latter are found, without the cross, in the Book of Kells and on the Kildalton Cross (en.2). The motif is rare in Britain, but occurs in simplified form on a slab from the early monastic site at Reask, Co. Kerry, and it is found on some Manx carvings of the Norse period (en.3*). The cross with double transom is also of Mediterranean, and more specifically Byzantine origin, and the few supposed comparisons in British and Irish sculpture, including those at Ellary (No. 20), are of much simpler character (en.4*). An 8th- or9th-century date is possible for this slab, but it could be later. (White, Knapdale, 103, pl.46, 1 and 2; ECMS, 3, 406; PSAS, 38 (1903-4), 136-40; Campbell & Sandeman, 72, no.462). WELL. This is a rectangular pool measuring l.4m by 1.1m by 0.6m in depth, lined with drystone masonry and partly covered on the w by a massive schist slab. The overflow forms a small stream flowing to Loch Coille-Bharr. 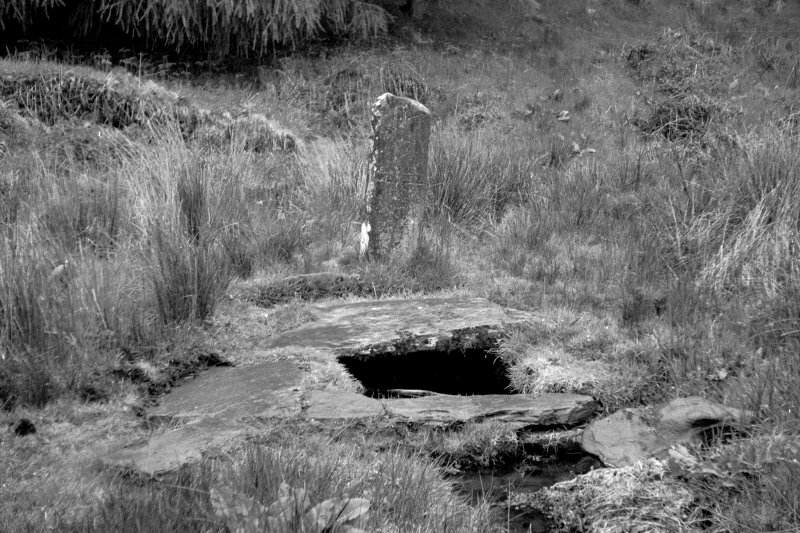 Cross-slab, 1.37m in visible height by 0.40m, beside a drystone-built well in a ruined township. The W face (a) bears in false relief a cross having two transoms with barred terminals, the lower one with curved armpits. Between them are discs, perhaps the sun and moon, and above and below are pairs of birds. Flanking the shaft were incised saltires, one now flaked off, and below and in the damaged top there are animals. The E face (b) bears an outline cross with a triangular upper terminal and an open foot flanked by horizontal base-lines. A series of vertical incisions down the shaft is probably early. NR 78080 90245 Site included in an archaeological evaluation carried out as part of the Dalriada Project. The settlement buildings were photographed and recorded in detail along with measured sketch plans drawn, to give an overview of archaeological potential of the site. 17 potential structures were identified, these in various states of preservation. The structures would appear to represent both byres and domestic buildings while two 'sub-circular' mounds of rubble possibly represent corn dryers. potential structures, in various states of preservation, were identified including possible byres, domestic buildings, two ‘sub-circular’ mounds of rubble that may represent corn dryers and buildings superimposed over earlier structures. 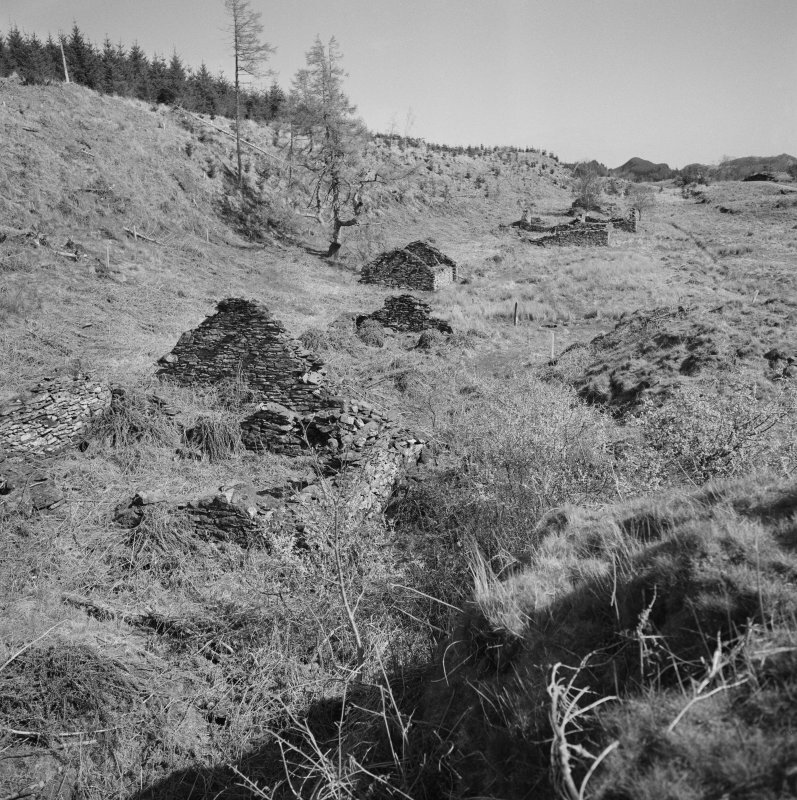 In April–May 2008 two trenches were opened across two badly collapsed structures (Structures 3 and 7) that were thought to represent the earliest buildings in the settlement. The excavation revealed that the two structures were probably in use until the settlement was abandoned. peat store. Structure 3 appears to have replaced an earlier building (Structure 17). This earlier building was a post-built structure with evidence of stone and clay footings along one side. The building had a beaten earth floor with evidence of hearth placements. The age of this earlier structure proved elusive as no diagnostic artefacts associated with its use were recovered. The date at which the settlement was abandoned remains unclear, although documentary research indicates it was not long after the Arichonan clearance in 1848. In 1843 those tenants liable to pay road money from Kilmory are listed as Neil McCallum, John Gillies, Archibald McDugall and Angus McDougall. Further research needs to be done, but these men and their families may have been the last to occupy the settlement, and it may be the remains of their life here that we have recovered during the excavation. The website text produced for Kilmory Oib webpages on the Forest Heritage Scotland website (www.forestheritagescotland.com). In Knapdale Forest, near the edge of Loch Coille Bharr, you can discover the remains of the township called Kilmory Oib. Usually referred to simply as Kilmory, the township is part of the estate known as Oib, or Oab, meaning bay or inlet in Gaelic. The lands of Kilmory belonged to the Campbells, but in 1785 a bankrupt Neil Campbell sold them to Neil Malcolm of Poltalloch. The township consists of at least seventeen buildings, including houses and byres for the animals. There are also two sub-circular piles of rubble, which may be the remains of corn drying kilns. 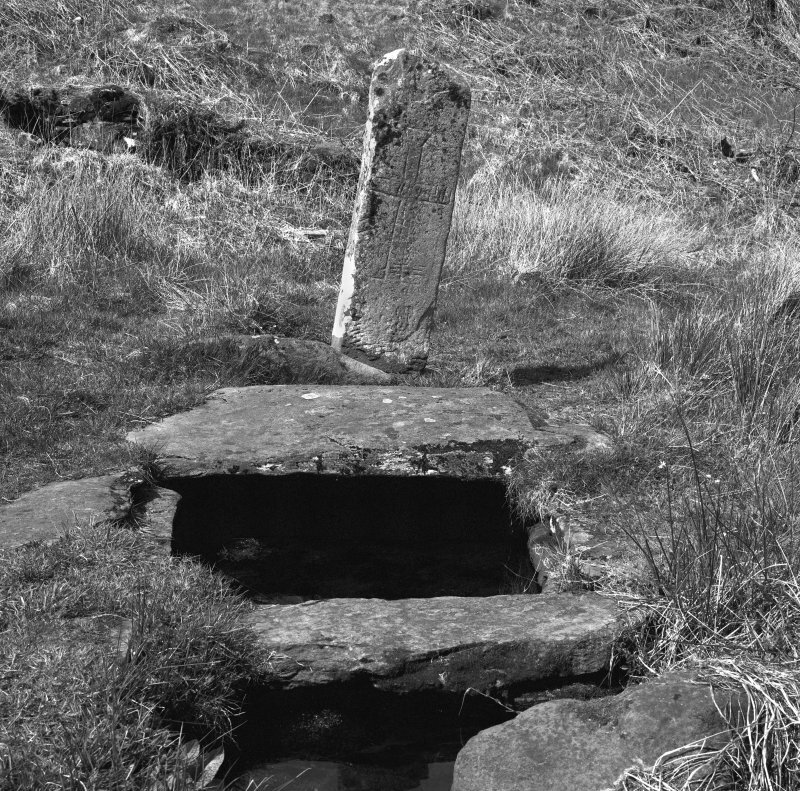 There is also an early Christian cross-marked stone, which stands beside a small well. It is thought that the stone dates to the 8th or 9th century. Historical records mention Kilmory from around the 17th century. One of the earliest known references is in the 1694 Hearth Tax. It records tenants Alexander and Malcolm McIlvernock, Robert Campbell and Donald McMillan as having paid their taxes. One of the last references is on another tax list, the 1843 Road Money tax, which lists Angus and Archibald McDugall, Neil McCalum and John Gillies as tenants. It is unknown exactly when and how Kilmory was abandoned but the buildings are shown as unroofed by 1873 when the 1st edition Ordnance Survey map was published. Read our "People" story to find out more about what could have happened. Kilmory Oib has family connections to the nearby township of Arichonan, where the tenants rioted against eviction in 1848. At the beginning of the 18th century, Neil Malcolm of Poltalloch bought the lands of both Arichonan and Kilmory Oib among others. In 1848, Malcolm ordered the eviction of his tenants at Arichonan. You can discover more about this on our Arichonan pages. The tenants did not go quietly and a riot began. Historical records show that those involved were not limited to the tenants of Arichonan. Amongst the rioters were two McMillan brothers from Kilmory, sons of one of the evictees, Neil McMillan. Although arrested, the brothers escaped punishment. Their younger brother, Neil McMillan Junior from Cairnbaan, was not so lucky, however, and served an eight month jail sentence. Another Kilmory rioter, John Gillies, escaped the law and disappeared. The Kilmory Oib tenants probably fought not only for family and for friends but because they feared their own homes were in danger of the same threat. The purpose of the Arichonan evictions was to clear the land for sheep farming. Today, if you explore Kilmory, you can discover evidence that supports the later use of this site for sheep farming. This evidence is similar to that found at Arichonan, for example some buildings have been partly demolished; the walls left form enclosures that are ideal for keeping sheep.